Thousands of Apex Legends players continue to get scammed into believing a mobile version of the game exists when in fact they are being fooled. Avoid this Apex Legends Mobile scam. 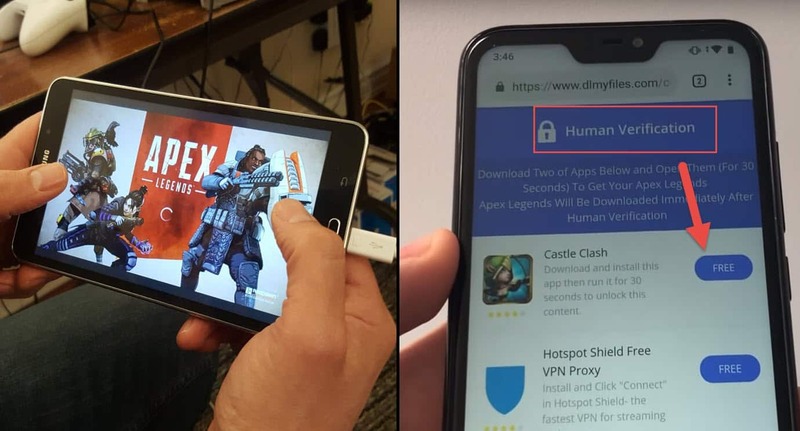 Whether you are a tech savvy guru or a gullible believer, there are certain companies out there that continue to launch fraudulent websites, tricking users into believing they can play Apex Legends on a mobile device. The truth is, there is no way to play it on mobile and no official app has ever been mentioned by game developer Respawn Entertainment. However, people are continuing to get fooled into believing they can download the app and play it. We are here to help expose this scam and make users aware of the problem. So what type of scam is going on? In this article, we will explain how to avoid these traps, while keeping your mobile devices safe from harmful downloads. 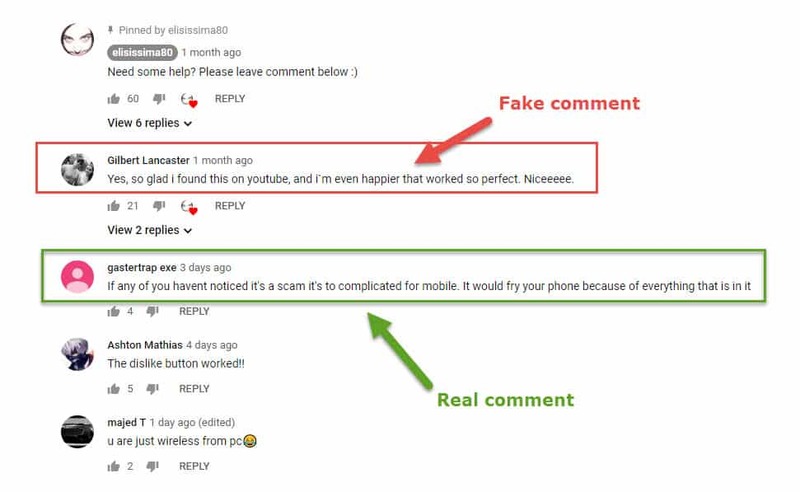 The primary culprit of the scam chain is Youtube. 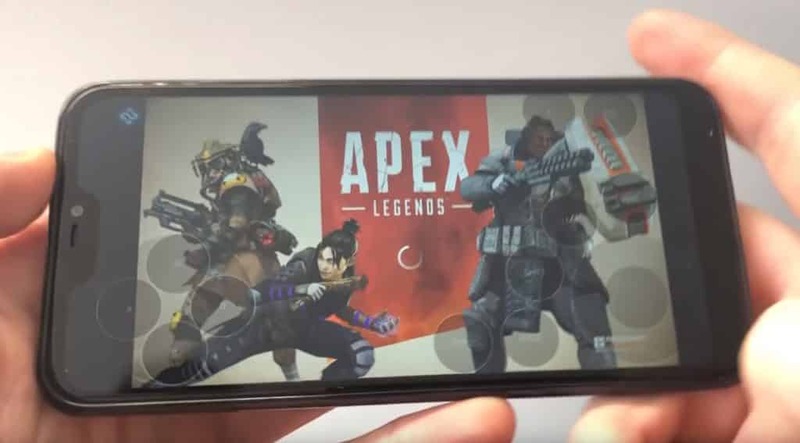 Videos are created showcasing fake illustrations of what seems to be Apex Legends working on a mobile phone. As well, the people in the videos are doing a pilot run of a pre-recorded video. So when the person moves his thumb right, which shows the on-screen player moving right, it’s because the person knows when to move his thumb to make it look like he’s controlling the player. 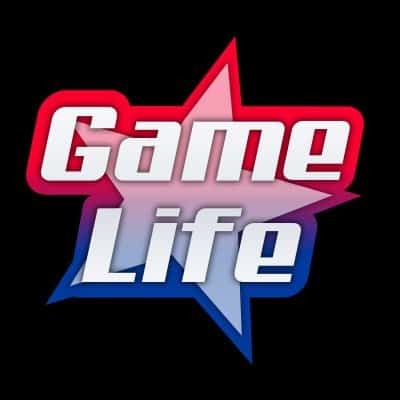 Game Life has tested the exact offer shown in the video below, which we can conclude that it is indeed a scam setup. 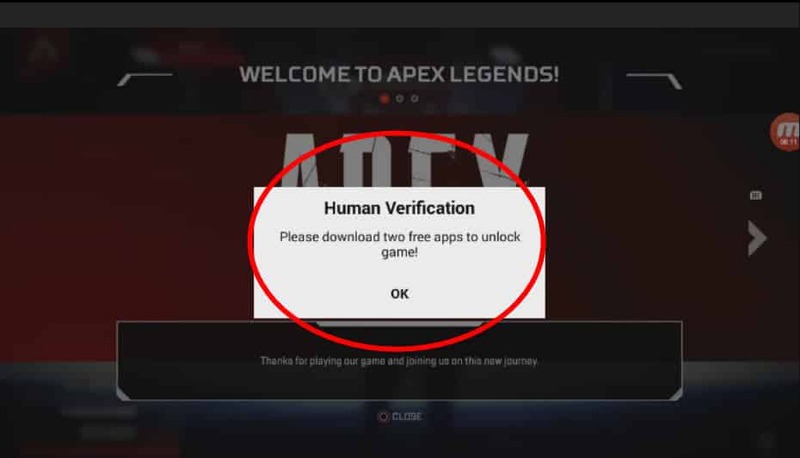 To understand what is happening, here is one example of a video showing a fake demonstration of Apex Legends on mobile and what steps need to be taken to unlock it. There are many people who believe these type of videos are true because they come from a trusted source in Youtube. The narrator comes across as convincing as he’s filled with enthusiasm and wants you to believe his intentions are innocent. Why Are These Scams Popping Up Now? 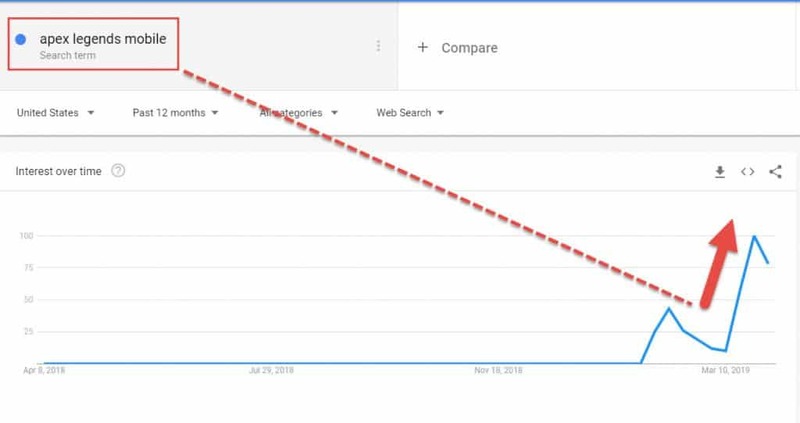 A simple Google Trend search will reveal that many players have searched for the keywords “Apex Legends Mobile”. Due to the success of Apex Legends and the millions of users that have downloaded it, there will be a fair amount of players who prefer playing is on their mobile device. Shady companies who look capitalize off of search terms like this will orchestrate a way to profit off of gullible users. Here’s a look at the keyword in the past month. Not everyone is trained to spot fake apps. Unless you’ve gone through the entire process of trying to download an app that doesn’t exist, you’ll need some help to spot them. 1) Never download/install an app file from 3rd party websites or portals. If the app does not direct you to either iTunes or Google Play, you put your device at major risk of personal data breach. In the video above, it is required for a user to browse a website and download the apk file and install it manually. The app did not originate from its developer’s store front. 2) Once the fake app is installed, it will show up on your desktop and execute like any ordinary installed application. However, it mentions that in order to play the game, you must complete a set of tasks to unlock the full feature of it. In the case above, they are asking you to install two additional apps, then return to the Apex Legends Mobile app to have full access. These are unnatural paths to downloading an app, which should be the first red flag. Google or Apple will never ask you to go through unnecessary paths just to have access to an app. Fake Apex Legends mobile game asks to install 2 additional apps to unlock the game. Incentivized marketing tactics. Online marketers get paid by companies to help get them app installs. Incentivized app downloads mean getting users to install an app. In return, users are rewarded a prize, token, gift or in this case, an unlocked Apex Legends game to play. The video makes users believe after installing 2 additional apps that the game will be unlocked and ready to play, when in fact this is not the case. After following instructions and installing additional apps, the fake Apex Legends app never changes. It remains an intro video and asks you to repeat the same steps. The video shows a fake front of what seems to be the mobile user selecting his character. By looking closer you can clearly see a cursor in the background, a sign of pre-recorded content. Another thing to always keep an eye on are fake likes, and comments. Both can be purchased for cheap to help bolster trust, with positive comments and likes. This fools the audience into believing the video is trustworthy. The way some of these shady people build trust is to purchase “aged” YouTube accounts. What this does is not set off any red flags for YouTube, and to users. The prerequisite to the paid account is that they need to have followers and need to be aged. A telltale sign to see if the account was purchased is to look at the “About” page and see how old the account is. The next thing is to look at the videos and see if there’s any correlation. In this particular case, the account is from 2007, and all the videos are from 7 years ago. The videos are also in Italian, showcasing family get-together’s . However, after the account not being used for 7 years, an Englishman uploads a video on how to download Apex Legends on your mobile phone. Sound fishy? Many of the scams originate from YouTube. Reporting a video is the best way to have the content removed by Google. Disliking a video will not help in having it removed. Over time, a video that has been reported by many viewers can be flagged and taken down as YouTube will be prompted to investigate. YouTube has a dedicated team that look into reports. Sharing the news with others is also a good way to stop this type of scam. If you know someone who might fall for these type of app offers, let them know there is no Apex Legends mobile version. You can also follow Google’s website report for inappropriate content. Respawn entertainment has yet to confirm if and when an Apex Legends mobile game will be available. Until then, there is no other type of mobile version. If you stumble upon what seems to be a Apex Legends mobile version, it is 100% a scam. Don’t be fooled.